LOCATION: In the central part of the resort, at about 900 m from the beach. HOTEL CAPACITY: 4 floors, 22 rooms and 7 apartments. 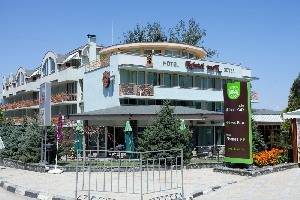 HOTEL FACILITIES: cafe-bar, outdoor swimming pool, safety deposit box, parking and internet WiFi, children playground. 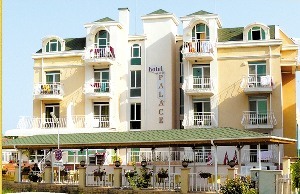 Resort Kranevo is one of the most picturesque places on the Bulgarian Black Sea coast. With its unique nature, marine and forest landscapes, it is a wonderful place for your holiday. Kranevo will welcome you with genuine and unadulterated natural beauty - a perfect place for eco-tourism. Here is one of the most magnificent beaches on the Black Sea - a vast, with fine sand and the water is clear and clean. Surely you wanted to walk in the nature reserve "Balata", which will see over 60 years “longoz” forests, unique plant and animal species. In recent years, Kranevo changed beyond recognition and has become an attractive place for tourists from around the world. There are over 300 family hotels, resorts and residences, numerous restaurants, cafes, bars and discos that can diversify holiday everyone. In the immediate vicinity is the beautiful and romantic city of Balchik Botanical Garden and the Palace of the Queen Mary, which will impress you with its mysterious charm. Nearby is the legendary cape Kaliakra and „Kamen brqg” with Yailata - center of hippies worldwide.